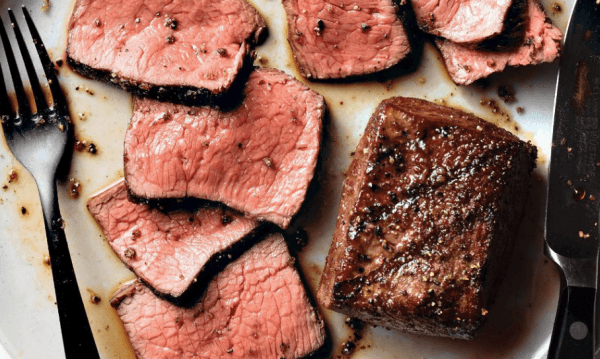 26 Meat Subscription Boxes That Will Satisfy Any Carnivore are particularly high demand. Most adults aren't candy-obsessed, but there are tons of people out there that simply love (and can't get enough) meat! 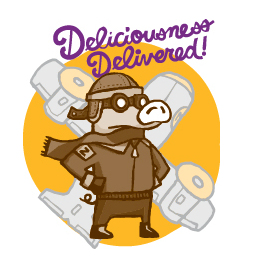 There are various styles to choose from within the realm of monthly meat delivery. Some boxes focus entirely on meat-based snacks, with jerky being the most popular variation. Others provide meat in a different form, like packets of bacon or meat for the grill. Oh, and did I say bacon? We’re covering all of the styles in this list. Check out the different areas to find the perfect box for you. PS. since you like meat, check out our manly food subscription boxes. PPS. Here's the breakdown of all the themed meat clubs by category, each in their own list. The links below will take you directly to the full list with all clubs. The “meat” club list you're on right now is just the best ones, and not the full scope of what's out there. 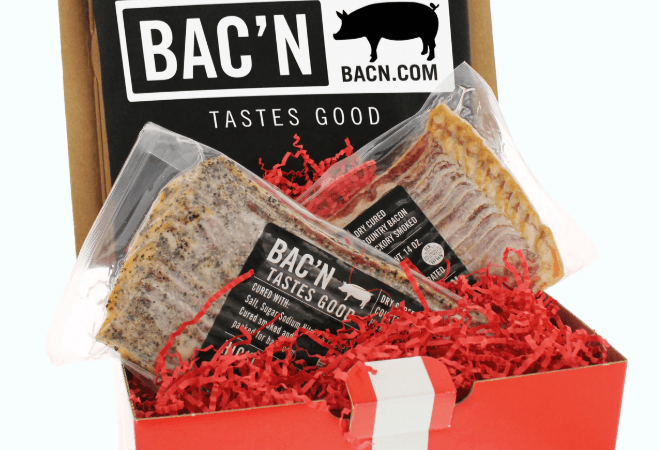 Here’s a subscription that’s entirely designed for bacon lovers. We all know that bacon is the king of meat, right? There’s something about it that is simply amazing – and it suits almost any occasion. If you agree, then this Bacon of the Month Club could be what you’re looking for. The club provides you with 2 new packages of bacon each month (each is a 1-pound selection). The bacon itself is sourced from gourmet butchers throughout the United States. This means that there is plenty of variety. You may even find flavors and styles that you didn’t know existed. This bacon subscription is certain to make your month. With a name like Bacon Freak, it’s easy to guess what this company focuses on. Their site sells a wide range of bacon-related products, including some that you mightn’t have seen before. There are also multiple bacon of the month clubs to choose from. The most significant is their Bacon is Meat Candy Club. This can be joined for 3, 6 or 12 months. It provides you with 2 packets of bacon each month. Your first order also contains a t-shirt. There are variations on the club too, including a wedding edition, a gluten free version and a no pepper option. Alternatively, you can look at their Swine and White Wine Club (3 months) or their Swine and Red Wine Club (3 months). These just offer a single packet of bacon per month each, along with a bottle of wine. You’re not limited to bacon either. The site also offers a Sausage of the Month Club. This is a 3-month subscription only. This subscription provides you with 2 packages of pork sausage each month. Here’s a more predictable bacon club to consider. Most bacon subscriptions state that they will provide you high-quality bacon in various styles, but don’t give you many details. The Zingerman’s Bacon Club takes an entirely different approach. Instead of keeping things a surprise, the site provides a list of what bacon you’ll get each month for each different subscription length. The style takes the surprise out of the process, but it could still be appealing. If nothing else, you can get a sense of whether you’ll enjoy the subscription before you spend any money. While this club comes from iGourmet, it isn’t as simple as it first appears. iGourmet doesn’t focus on bacon, but the company is a popular choice for gifts and subscriptions. Their Bacon of the Month Club is one such example. This club offers 2 different pouches of bacon each month. These contain somewhere between 12 ounces and 16 ounces of bacon per pouch. As well as the bacon itself, the iGourmet club provides you with a detailed newsletter. 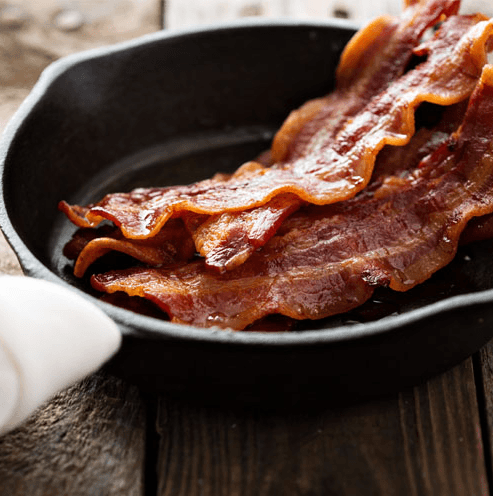 The newsletter includes details about the bacon in the shipment, focusing on details like the styles of smoking, information about the bacon maker and the types of spices that are applied. 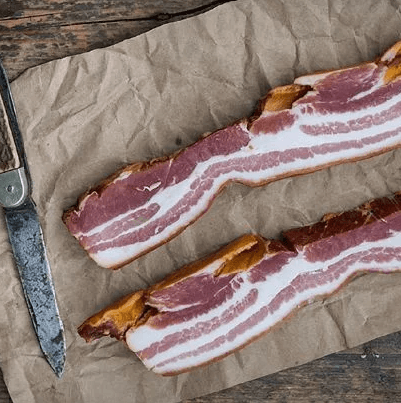 Because the subscription provides bacon from many different companies, it’s also a fantastic way to experience how bacon taste and texture can vary between manufacturers. The subscription is simple to join. It costs $42.99 per month for a 3 or a 6 month membership. Alternatively, you can pay $38.69 per month for a 12 month version. These memberships do need to be paid for up-front, but they’re worth the price. This bacon subscription may offer more variation than most. 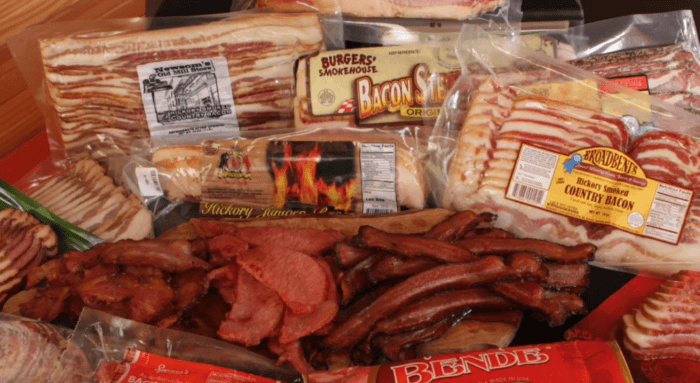 There are multiple monthly clubs offered on the Goldbelly site, including this Monthly Bacon Subscription. The idea is simple. Members receive a variety of bacon each month. Goldbelly focuses on including many different types of bacon, such as double smoked, spiced or peppered bacon. The site provides few specifics about the bacon and there are no details about how many packages of bacon you will get. Even so, members will get enough bacon to serve 6 people, so it’s not a tiny amount. Here’s a good subscription if you want more control over the bacon that you are sent. Most bacon subscriptions send you a selection of bacon flavors, often from different companies. The idea works well if you want to experience new types of bacon. It’s good for anyone who gets easily bored too. On the flipside, some people prefer predictability. If you want more control over your subscription, then the Tender Belly Bacon of the Month Club could be a very good choice. This club sends you out 4 packets of bacon each month. 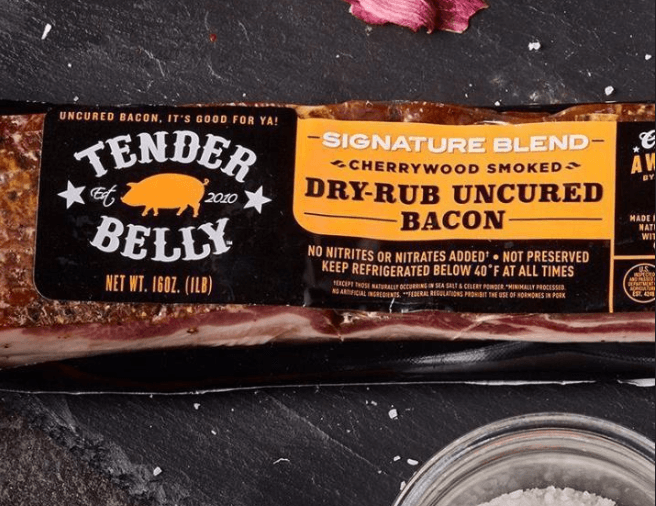 The bacon is produced by the Tender Belly brand itself. The bacon packages tend to contain 1 pound of bacon each. However, you will get 12-ounce packets instead if you choose java rubbed or no sugar bacon. The difference in size brings up an interesting point – choice. Tender Belly gives you the unusual ability to select which bacon flavor you receive each month. Some of the options include Java Signature Dry Rub Uncured Bacon, Signature Dry Rub Cured Maple Bacon and No Sugar Dry Rub Uncured Bacon. The subscription costs $59 to $69 per shipment. That’s surprisingly reasonable for a club that provides as much as 4 pounds of bacon per month. This subscription provides you with 3 pounds of bacon every month. If 2 pounds of bacon a month isn’t enough, what about 3? That’s exactly what this Heritage Foods Bacon Subscription offers. 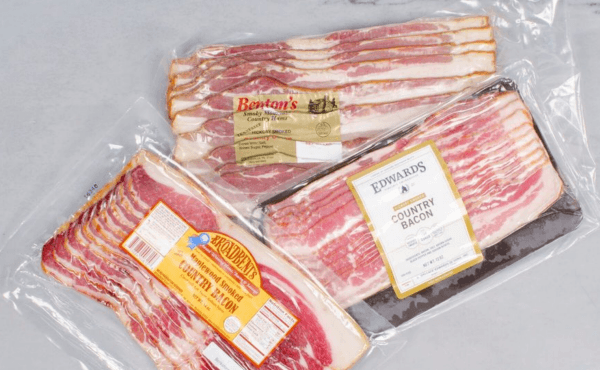 Each month's subscription provides 3 packages of bacon, typically from different producers. This approach gives you the chance to experience the way that bacon can differ from one producer to the next. To make matters even more interesting, Heritage Foods focuses on a combination of new and old curemasters. This creates even more variation and is a powerful approach. The subscription itself is simple. You pay $59 per month for your membership. There is no pre-payment to worry about and you can cancel at any time. This bacon club offers variety and quality – a powerful combination. Bacon clubs often provide meat from many different brands. The style always works well for variety, but it means that the quality can be inconsistent. 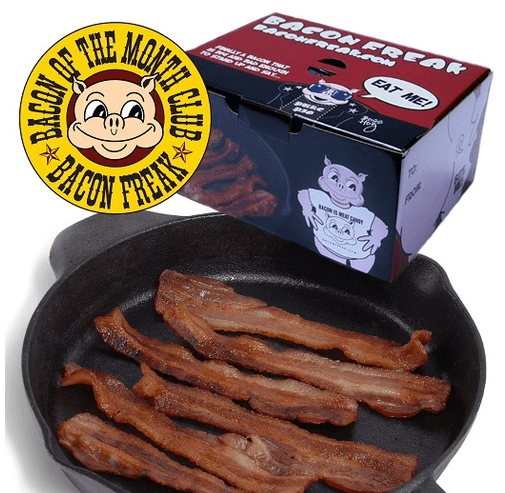 The Bacon of the Month Club from Bac’n takes a different approach. It offers 2 packets of bacon each month that the company produces itself. By doing so, Bac’n helps ensure that you get quality bacon each time. You’re not stuck with a single flavor either. Each monthly shipment includes 2 different flavors, chosen from the 12 that the company sells. You even get a free t-shirt with your first subscription box. There are 3 different subscription lengths to choose from: 3 months, 6 months or 12 months. You need to pre-pay for the subscription, but they average out to $50, $45 and $40 per month, respectively. There is also a nitrate free and a no pepper option if you select the 3-month club. 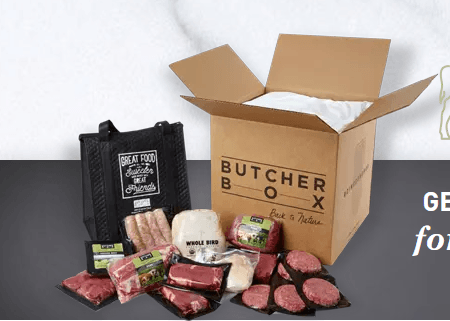 If you want meat and nothing more, Butcher Box is a popular choice. Many people rely on Butcher Box regularly and the service always gets good reviews. The basic idea is simple – meat. Nothing more, nothing less. Members can order 5 different types of boxes, which are all shipped out monthly. Each box contains a selection of raw meat. The specific types of meat and cuts that are included vary depending on the box that you choose. The 4 main options are the Mixed Box, Beef & Pork, Beef & Chicken or All Beef. Each of these cost $129 every 30 days for 24 meals or $238 for 48 meals. Of course, how many meals a box provides will depend on the number of people that you are feeding and how much everyone eats. There is also a custom box. This costs $149 for a 9 to 14 pound box and $270 for an 18 to 26 pound box. While this version is a little more expensive, it does provide full control over the cuts of meat that you receive. It’s the perfect style for people who know what they want. You can also add additional items to fill the box out more. With 4 club types, Ohama Steaks is an especially interesting choice. There’s always a risk that meat clubs will look the same, but Ohama Steaks does stand out from the crowd. The site is one of the best places to look online for meat. They even sell other foods that you might need, like starters, sides and desserts. They offer 4 types of gift boxes, which can all be ordered as a shipment every 1, 2 or 3 months. The price per shipment is best if you’re ordering monthly, but you might find that you want the food less frequently. The first choice is Steak Gift Boxes, which cost from $79.99 to $149.99 per shipment. There are also Grilling Gift Boxes, which range from $79.99 to $139.99 per shipment. The other 2 clubs focus on seafood and on meals, respectively. The meals version is the least expensive, partly because you’re receiving prepared food. This company offers multiple raw meat subscriptions to choose from. Heritage Foods is another powerful site if you want to order meat online. They provide a considerable selection of high-quality meat, including plenty of meat clubs. In fact, there are 8 distinctive clubs to choose from, including a bacon subscription, chop subscription, steak subscription and a sausage subscription. There are also some mixed subscriptions. These provide a wider selection of meats, perfect for your cooking needs. For example, The Essentials Box provides 3.75 pounds of ground pork, chops and burgers, for $47 per month. Alternatively, there’s The Sophisti-Kit, which contains 3.5 pounds of chops, bacon and steak each month. All of the subscriptions are month-to-month, ranging in price from $47 to $145. They are sent out at the first of each month unless you choose a date that you prefer. The month-to-month style means you’re only ever paying for one month at a time and the subscription is easy to cancel. This subscription is an easy way to receive Krave jerky every month. 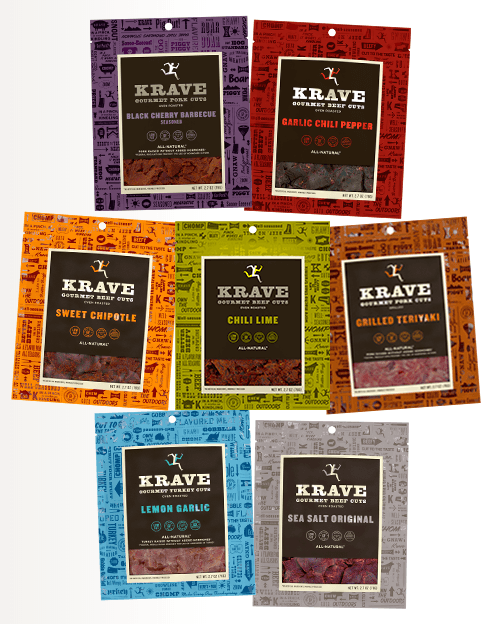 Krave is a popular meat snacks brand – offering jerky, bars and sticks. They have beef, pork, turkey and chicken protein products to select from. The Krave Klub program simply gives you the way to get Krave products delivered to you on a regular basis. Krave uses an unusual style, as there is no single club that you sign up to. Instead, you have the option to sign up for a Klub Subscription whenever you are ordering from the site. For example, if you chose the Lemon Garlic Turkey Jerky, you could order a single bag for $5.99 or an 8-page for $43.92. You would save 10% on those prices by selecting the Klub subscription instead. The approach makes it difficult to get a selection of products each month. Still, it’s a good choice if you know exactly what flavor of jerky you want. 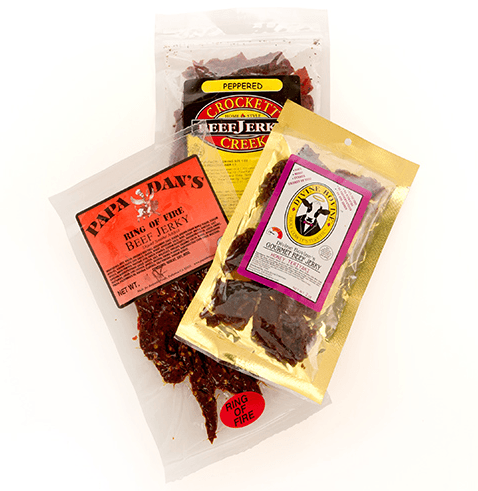 There are also sampler packs, such as one that contains 7 types of jerky. Getting one of these on subscription would provide you with plenty of variety. This subscription box mightn’t be well-known, but it does pack a punch. BoJerky comes from the same company as BoCandy. 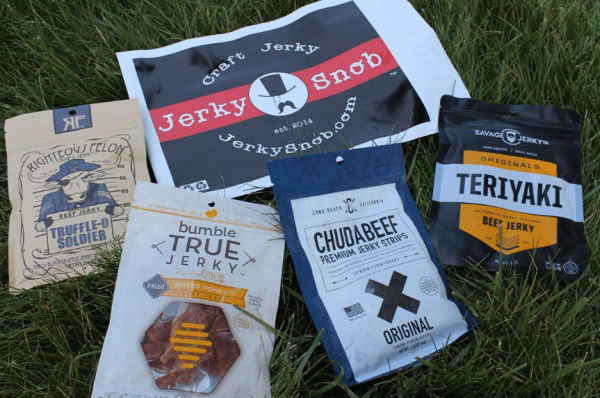 While BoCandy is popular, the jerky subscription service isn’t advertised well and is easy to miss. 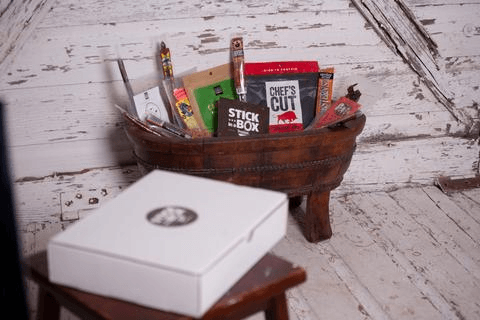 Bojerky bills itself as a ‘premium beef jerky subscription box’. This should mean that the jerky is high-quality and focuses on reliable brands. That’s not all. Bojerky aims to be different. You’re not going to find the same packages of jerky that you could buy at the local store. Instead, Bojerky works with craft jerky creators from throughout the United States, providing you with new and unusual snacks each month. There are 2 different plans that you can choose from. 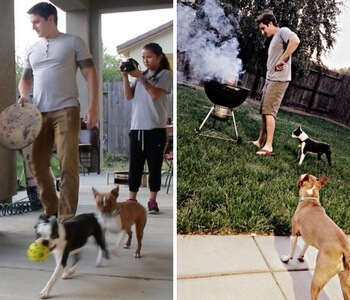 The first starts out at $21 per month and contains at least 2 full-size bags of jerky. The other starts at $35 per month, offering you 4 bags. You’ll often get an extra snack in the mix too. As you might guess, the price per month decreases if you pay for multiple months up-front. This club is designed with the refined jerky consumer in mind. If you want amazing jerky, JerkyGent is a club to seriously consider. The service focuses on artisan jerky creators from across the United States. Jerky products are carefully tasted, reviewed and evaluated, with only the very best making their way into the subscription program. This isn’t your typical subscription program either. 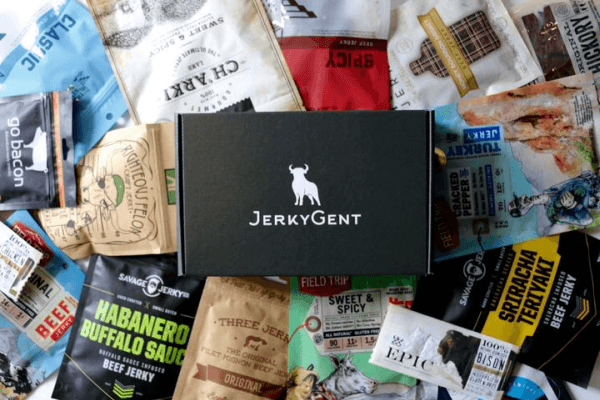 JerkyGent provides more control than most clubs, allowing you to select a spiciness preference and a flavor preference. As part of this, you can choose to receive non-traditional jerky flavors, an option that few other clubs provide. The subscription itself costs $29.99 each month and is charged on a month-to-month basis. You receive 4 bags of jerky every month, adding up to between 6 ounces and 10 ounces of jerky per box. This is a particularly popular jerky company, one that provides a wide selection of products. SumoJerky prides itself on offering delicious jerky from around the world. This includes an emphasis on unusual and hard-to-find flavors, along with natural ingredients. Many of the featured companies are rare or produce jerky in small batches. As a result, you’re receiving uncommon bags of jerky, ones that you couldn’t find locally. The flavor combination varies, including some common choices and some that you don’t see as often. You don't have much control over the flavors, but you can choose whether you want a regular mix or only mild jerky. There are 4 different size options to choose from with this club. They are 2, 3, 6 and 12 bags of jerky per month. The prices are $16/month, $23/month, $44/month and $80/month, respectively. You do pay shipping fees with the first 2 versions, but shipping is free if you want 6 or 12 bags per month. This jerky club isn't complex, but it is still a very appealing option. This Jerky of the Month Club is promoted as a gift. You can even download a gift card that tells recipients exactly what they can expect. Of course, there’s nothing stopping you from buying the subscription for yourself too. The subscription can contain either 1, 2 or 4 packs of jerky each month. The bags range between 2 and 4 ounces. As a general rule, any conventional meats come in 3 to 4 ounce bags, while exotic meats are in 2 to 3 ounce bags. Unfortunately, there is no month-to-month option with this subscription. You can only order for 3, 6 or 12 months at a time. Still, that style works well in many situations, especially if you do plan to give the subscription as a gift. This American made jerky company gives you plenty of jerky each month. 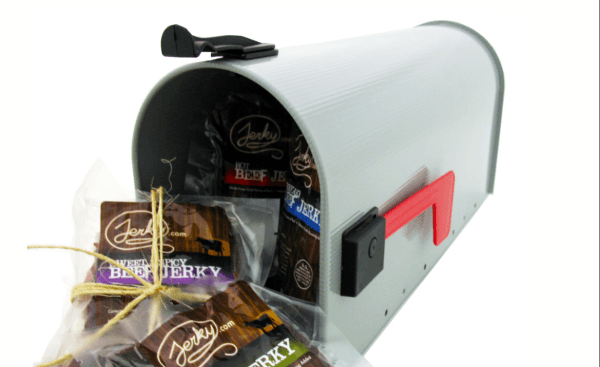 If you’re a fan of natural and American made products, LOLJerky could be a particularly good choice. The jerky is even paleo-friendly, low in carbs and high in protein making it especially relevant for your health. LOLJerky has plenty of supplying brands, so you can be certain of variety in your shipment each month. The subscription provides more variation than most, giving you 4 different shipment sizes to choose from. A single bag per month will costs you $9.95, 2 bags will cost $18.95, 3 bags will cost $24.95 and 6 bags will cost $39.95. Each version also offers the chance to pre-pay for your subscription. The smaller variations also provide bonus samples on occasion. One other thing to mention is the flavors. 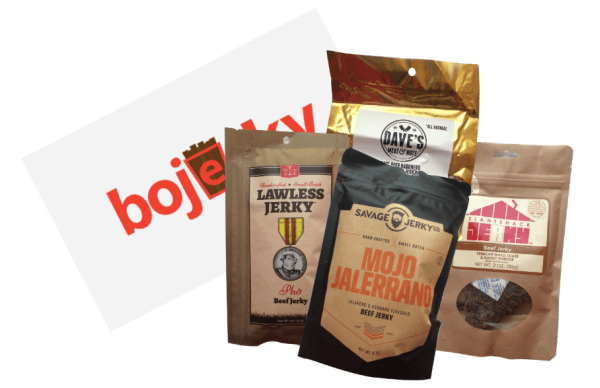 Like many companies, LOLJerky focuses on traditional jerky flavors. This style is often appealing, as you can be confident that you’ll enjoy most (if not all) of the jerky that you receive. While non-traditional flavors are more adventurous, there is a greater risk that some won’t suit your taste preferences. This jerky club follows a different style than most. If you want something a little unusual, Stick in a Box is worth considering. For the most part, this is a jerky club, offering various bags of jerky each month. Still, that’s only part of the story. The full monthly subscription contains 6 to 8 items. Some of these are bags of jerky, while others are meat sticks or similar items. The style means that you’re getting more products each month. This is perfect if you want snacks on the go or if you want to share some of the products around. The club doesn’t provide details about what you can expect each month, but you can be certain that the jerky will taste amazing. When it comes to subscribing, there are a few different options. You can order month-to-month for $35 per month. Alternatively, there is a 6-month membership that averages out around $30 each month and a 12-month membership that is around $25 per month. If you’re not convinced, you can also check out their Lite Knight membership. This is designed as an introduction and is just a partial box of products. It’s also inexpensive, costing $10 per month for the subscription, plus $5 for shipping and handling. Most jerky clubs come from companies that specialize in jerky, but that’s not the case here. This Jerky of the Month Club comes from Amazing Clubs instead. As the name implies, Amazing Clubs offers a variety of different clubs for you to choose from. This includes some common styles and other more unusual options. Their jerky version focuses on artisan jerky products from across the United States. These all rely on natural ingredients. The subscription even comes with a ‘They’ll Love It!’ guarantee. This guarantee helps ensure that you’ll get decent jerky each month. You have the choice of paying for the subscription month-to-month or pre-paying for 3, 6 or 12 months. The price is roughly the same each time, around $27.95. Amazing Clubs also runs specials from time-to-time. These can decrease the price further. This jerky club focuses on small-batch artisan jerky. Jerky Snob is a good choice if you want to be certain that your jerky is high-quality. 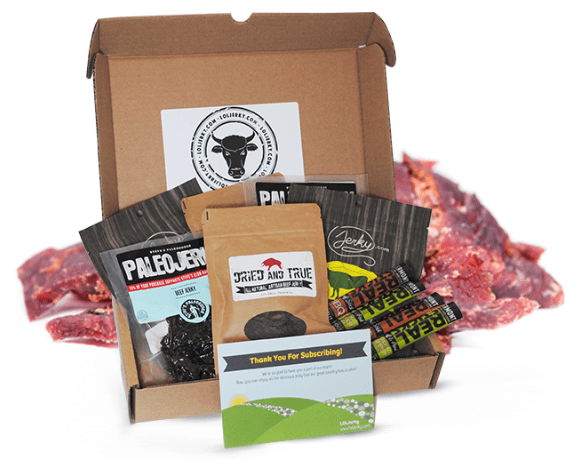 The subscription provides you with jerky from artisan producers throughout the United States. This is much better than the conventional mass-produced products that you find in local grocery stores. The company has plenty of suppliers to choose from, so you won't just be receiving the same jerky time and time again. You’ll also get plenty of interesting flavors in the mix. A particularly good feature is the subscription box size. You can select between 3 different sizes, giving you control over how much jerky you get every month. The smallest option is 2 bags per month, for $15. The next step up is 4 bags (around half a pound) for $27, or you can receive 8 bags (around 1 pound) for $54. This unusual subscription is light on the details, but still looks great. This Monthly BBQ Subscription is described in an odd manner. It comes from Goldbelly and the site talks about how members will receive ‘hand selected BBQ on a monthly basis’. 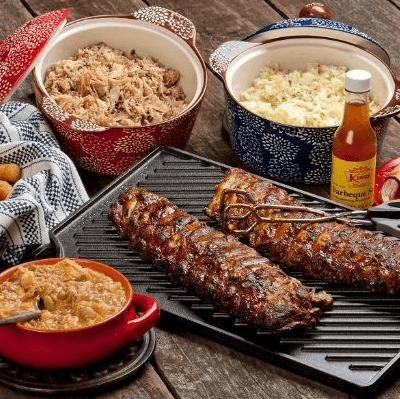 BBQ isn’t exactly a product type and the term could mean anything from BBQ sauces, rubs, wood chips or meat, not to mention plenty of other options. From the images and list of previous items, it looks like you’re getting BBQ meat every month, enough to feed 4 or more people. The subscription would be a fun way to get meat for grilling. You could even combine this with a BBQ sauce subscription or something similar. This could be the perfect club for people who want variation. 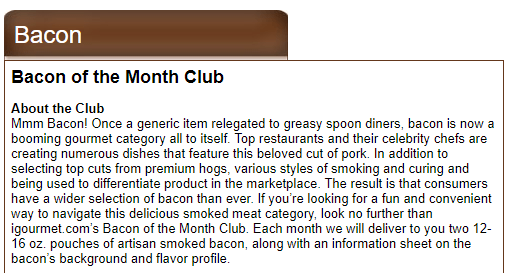 This Cured Meat of the Month Club is an interesting alternative to consider. The club provides you with 2 types of cured meat each month. The boxes can include bacon, ham, sausages, spread and salamis. This approach means you’re not getting the same type of food every month. That’s a plus in many situations. The club costs $150 if you want to join for 3 months or $295 for 6 months. There’s another aspect to consider too. This club provides you with a list of what you’ll get each month before you sign up. While this means that the order is always the same, the style can help you figure out whether the club would be right for you. The Carnivore Club provides you with meat and a lot of it. The name Carnivore Club really says it all. This club is targeted at anyone who loves their red meat. Don’t worry though, you’re not just getting a box of meat. 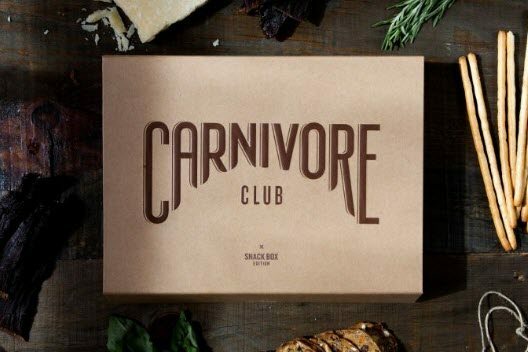 The Carnivore Club goes to great lengths to keep their boxes interesting and engaging. To do this, they offer a Snack Box and a Classic Box. The Snack Box costs $24.99 per month and contains 4 to 6 different meat snacks. The Classic Box costs $39.99 per month. It still contains 4 to 6 items, but there is a greater focus on quality cured meats, rather than meat snacks. Most of the items can be eaten as-is, which helps to make the box a popular one. This subscription could be ideal for anyone who loves barbecues. Barbecuing is always a popular pastime and a great way to get friends and family together. So, what about this Goldbelly Monthly BBQ Subscription? It provides you with enough food to serve 4 or more people. That’s much better than having to scour the grocery store at the last minute. Goldbelly just states that subscribers are sent a ‘fresh box of BBQ’. That sounds great, but it’s not entirely clear what that box contains or how many different items are present each month. Some examples include Kansas City’s Jack Strack BBQ Famous Burnt Ends and NYC Hotspot Mighty Quinn’s BBQ. Those names strongly suggest that you’re getting cooked meat in your subscription – but even that isn’t clear. The box itself costs $89 per month. You need to sign up for a 3-month or a 6-month subscription. There are no month-to-month options. This BBQ club is the ideal solution for people who don't want to grill their own food. The BBQ of the Month Club from Pig of the Month makes its product selection very clear. 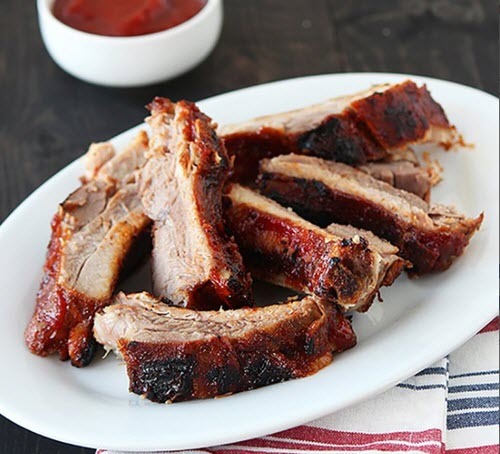 Each month you receive a box that contains cooked BBQ products (like Memphis style ribs and brisket), along with some bonus items (like spicy candied pecans and Thousand Island Dressing). The site even offers a full list of the different selections that are sent out each month. This makes it easy to decide whether the subscription is worth your time. If nothing else, it’s worth checking out that list, as some of the items sound amazing. Subscription ranges from $225 (for 3 months) to $899 (for 12 months). This averages out to somewhere around $75 per month. While that price is high, the amount of meat per month is significant. The food is tasty too. This club offers 3 different boxes of fish, along with meat that you can order separately. Fish is often considered in a separate category to meat, but it does offer many of the same advantages. It’s a key source of protein and a common ingredient in many meals. This Vital Box from Vital Choice is one of the best fish subscription choices on the market. Vital Choice itself is also a good company to order meat from – as they provide a wide range of amazing grass-fed cuts of meat. That being said, their subscription boxes all focus on fish. 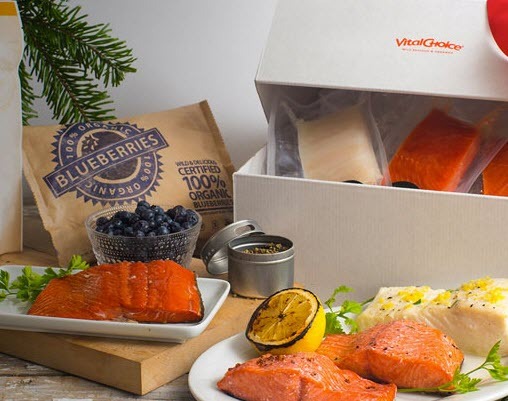 There is a Wild Salmon Box, for $129/box, which feeds at least 14 people. There is also a Wild Fish Box. This comes in at $169/box and feeds 15+ people. Finally, there is a Wild Seafood Box. The seafood version feeds 17 or more people and costs $199/box. The price isn’t surprising, as the seafood box includes the widest range of items. There is even shellfish present. There are plenty of images on the Vital Choice website to show you exactly what you can expect. Even if you’re more interested in meat than fish, the site is worth checking out. They have some amazing products.